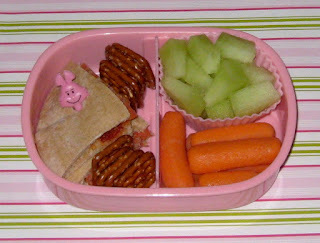 BentoLunch.net - What's for lunch at our house: Pita Pizza Bento! By far, this isn't the most inspired bento ever, but it's the first one in a long time where F&B came home and were that excited about the food. In reality, it was an attempt to use out some leftovers, but it ended up being pita shell pizzas. Basically, they are just round pitas cut in half and split open, then stuffed with pepperonis, cheese and a wee bit of sauce. I thought they were pretty simply, but they must have been unique enough to impress the kiddos. 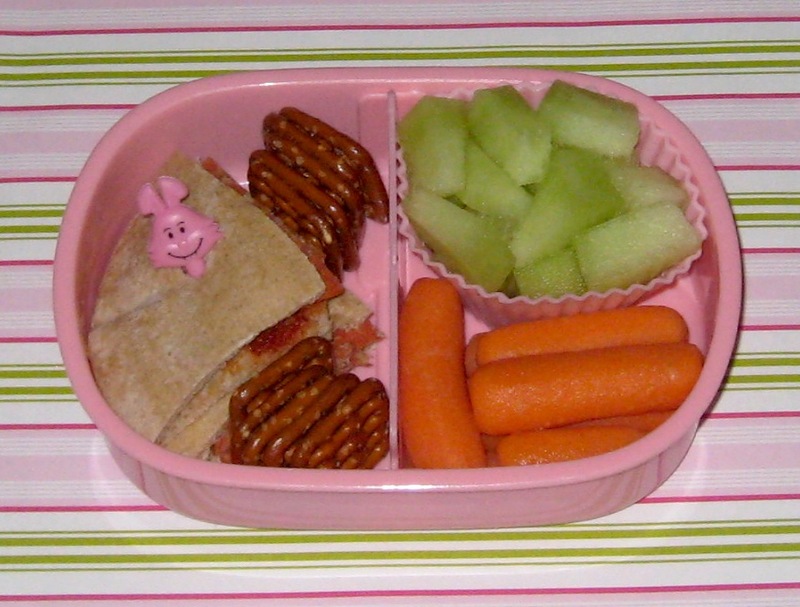 Faith had two of the pita pizzas (I quartered them for easier eating and stuffing), pretzels, carrots and honeydew. Very simple, but apparently, you never know what's going to strike their fancy!